The Syrian civil war is not the first conflict to complicate Professor Nicolò Marchetti’s efforts to turn Karkemish, an ancient city site on the banks of the Euphrates, on Turkey’s southern border and inside a restricted military zone, into a public archaeology park. Before his team started digging, under the watchful eyes of armed Turkish soldiers, he had to make sure that land mines planted in the 1950s had all been cleared away. Mr. Marchetti — a tanned and lanky version of Hollywood’s Indiana Jones, who teaches Near Eastern, or pre-classical, archaeology at the University of Bologna — has led excavations at Karkemish on and off for two years after being granted the first access allowed to anyone in decades. The aim is to open a first stage to tourism by October 2014. That goal remains realistic, he said during a tour of the site late last year. Still, conflict has had a way over the years of interrupting excavations here. First identified by the British Museum archaeologist George Smith in 1876 as the kingdom of Karkemish mentioned in the Bible, the site was later explored with permission of the Ottoman sultan by a team that included David G. Hogarth, C. L. Woolley and T.E. Lawrence — later known as Lawrence of Arabia. They found Assyrian and Hittite temples, palaces and hieroglyphics. Some of their discoveries went to the Museum of Anatolian Civilizations in Ankara, the Louvre in Paris, and the British Museum in London. Their work was halted by World War I. The dig briefly reopened in 1920 but was then closed again by fighting between the Turks and occupying French troops. When the dust settled, about a third of the 90-hectare, or 220-acre, ancient city of Karkemish was in Syria. The entire settlement, on both sides of the border, is classified as an endangered cultural site by the Global Heritage Fund, a nonprofit organization based in Palo Alto, California. But war is no respecter of culture: This month, NATO is preparing to place U.S. Patriot missile batteries in Gaziantep Province, where Karkemish is located, to ward off attack from Syria — though military officials say the deployment will be at least 40 kilometers, or 25 miles, from the site and will not affect it. Today’s Karkemish in some ways resembles other digs that dot the rural Eastern Anatolia landscape, like Gobekli Tepe and Catalhoyuk, with their own remarkable traces of early civilizations. But as members of Mr. Marchetti’s team crouched recently in a clearing to clean and consolidate the surface cracks of a limestone carving from 1000 B.C., a worker could be seen checking for mines along a distant ridge. The roughly $250,000 2012 budget for the joint Turkish-Italian expedition was paid for by the Italian Ministry for Foreign Affairs, the Italian Ministry for Education and The University of Bologna, along with a $30,000 grant for conservation from the G.H.F. The team is due to return to the site in August. Experts say every hit of the pick could add to what is known about the Iron Age residents and rulers of Karkemish, who grew wealthy by trading commodities like wine and honey, horses and slaves. Most of the finds date from the Iron Age phase between 1000 and 700 B.C., Mr. Marchetti said. Items like pottery shards are clues to food storage methods, and ornaments including a gold earring and lapis lazuli necklaces reveal the level of craftsmanship. The settlement, he explained, included an acropolis, an inner town walled by ramparts that are pierced by two gates, and an outer town with a double wall and two more gates, both of which now lie in Syria. A so-called Water Gate allowed entry from the Euphrates along a road that led to a palace and two temples and to a grand staircase up to the acropolis. The mound where the upper royal citadel was situated is now home to the Turkish military barracks, watchtower and helicopter landing pad. Archaeologists have been able to reveal a group of town houses where wealthy merchants may have lived, and a Neo-Assyrian cremation burial ground outside the city. Also found were items that tell of city government and the commercial role of Karkemish, including cylinder or stamp seals used by officials and merchants, some even engraved onto semi-precious gems. Thus far, the most significant discovery by the Marchetti team, which includes experts from Gaziantep University and Istanbul University, is a palace built near 900 B.C. by the ruler Katuwa. The palace remained in use, Mr. Marchetti said, through the Assyrian conquest in 717 B.C. It remained in Assyrian hands until the defeat in 605 B.C. by Nebuchadnezzar of Babylon. One “eureka” moment came when Mr. Marchetti almost literally stumbled upon a two-meter-high stele inscribed by King Suhi I from around 975 B.C. He said he figured it was important because a winged disk, an exclusive symbol of a great king, was clearly visible on the top. “I had entered with a pick in one hand and a camera in the other, and this is how we discovered the stele, lying on the ground,” he added. 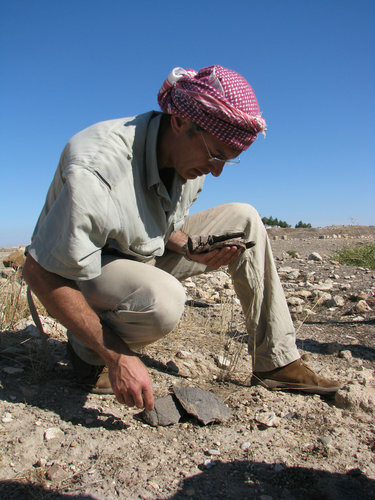 To read the inscriptions, the team relies on people like David Hawkins, a professor emeritus at the School of Oriental and African Studies in London, who is an authority on Anatolian hieroglyphic writing, and “a real living legend in our field,” Mr. Marchetti said, along with the dig’s deputy director, the philologist Hasan Peker of Istanbul University. Other finds include additional pieces from the Iron Age, the early Bronze Age, and even modern times with the discovery of a shovel thought to have been used by Lawrence himself. “We think our main scientific duty here is reconstructing material in order to produce more a detailed historical framework,” he said. But Mr. Marchetti has plans beyond the scientific for developing Karkemish as a public park, despite the obstacles. That the Turkish authorities respect Mr. Marchetti, who fluently speaks what he calls “village Turkish,” seems to have played an incalculable role in making the site available. Thus Mr. Marchetti’s second goal is a more social one: to help the locals who have welcomed him and his team by helping to create a sustainable source of income and inspiration that will last beyond the current excavations. The region around Gaziantep is primarily agricultural, and much of the economy, aside from smuggling, has been devastated by the loss of trade with Syrians who used to stream across the border to shop. With the support of the fund in California, the project also calls for the opening of a school for restoration, the education of local guides, and development of a high-quality venue for selling local produce and rejuvenated local crafts.